No trip is complete without trying out some of the best local food at your choice of destination. When you come to Asia, one of the must-try food is none other than dim sum, a traditional culinary art originated from Southern China that has captured the palates of many, especially in countries with strong Chinese influences such as China (duh), Singapore, Hong Kong, Taiwan and many others around the region. Dim sum (literally meaning, “touch the heart”) is the name for a selection of Chinese cuisine which involves a wide range of light dishes. They are usually served before noon, along with tea (also known as yum cha), but is now such a big part of the culinary scene in Asia that you can find restaurants serving them all day through. 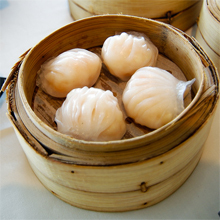 Dim sum are usually steamed, baked or fried, and come served in traditional bamboo containers. 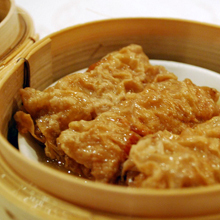 Here’s a quick guide through some of the more popular dim sum dishes. Har Gau (see below) and Siew Mai (or usually translated to Steamed Meat Dumpling) combine to form the one of the most popular pairing of dim sum dishes. I’ve eaten Dim Sum umpteen times, and never had one without at least an order of each. In fact, they are the first things my dad would order when eating dim sum. 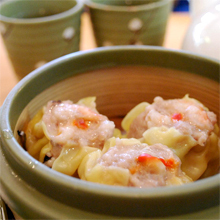 So while we ponder on what to order next, we’ll be munching on these delicious dumplings. The original Cantonese Siew Mai is usually made out of pork and mushroom, but nowadays you can find all kinds of Siew Mai to suit your preferences. I personally prefer Har Gau (Steamed Prawn Dumplings) compared to Siew Mai. The skin of Har Gau is delicate and translucent, wrapped around fresh juicy shrimps to form a pouch-shaped dumpling. They are usually dipped in soy sauce, rice vinegar, or even a combination of mayonnaise and chili sauce. This dish is a crowd pleaser, so be sure to order enough so that everybody will have at least one. This dish features a thin roll of rice noodles that are filled with meat, vegetables or other ingredients. Before serving, the roll is usually cut into a few pieces and a spoonful of soy sauce is poured on top. With a wide variety, this dish comes filled with shrimp, beef, char siew, or even youtiao (Chinese fried bread stick), chicken or fish. My personal favorite is Cheong Fun with Youtiao, which features fried youtiao wrapped in noodle rolls. The crispy youtiao combines well with the silky noodle rolls, melting away in your mouth with a heavy dose of soy sauce. Heavenly! 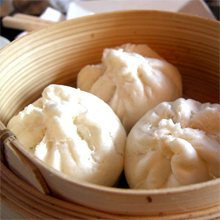 The most popular type of Baos (Buns) is Char Siew Bao, which simply means BBQ Pork Buns. They are soft bread with a unique texture, filled with char siew (BBQ pork) at the center of the bun. The char siew is pork tenderloin slowly roasted to achieve a tender and sweet taste, which combines well with the fine soft bread on the outside. Though Char Siew Bao is another popular dim sum dish, it is not exactly one of my favorite. As much as I enjoyed the taste very much, it is however, a very filling dish. My preference is to skip this so I can eat more of the others. Here’s another standard pairing when ordering dim sum. They are both similar in appearance, usually cut into square-shaped slices and pan-fried before serving. This makes them crunchy on the outside, but soft on the inside. The Daikon Cake is made of shredded radish and flour while the Taro Cake is made from the vegetable taro. Dan Tat (Egg Tarts) is the Cantonese interpretation of egg custard tarts which are popular in many parts of the world. This pastry was initially introduced to compete with dim sum restaurants, but ironically they have now become part of the dim sum experience. 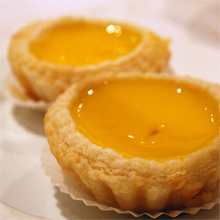 Many variations are available, including egg white tarts, milk tarts, honey-egg tarts and even bird’s nest tarts. Jin Dui (Sesame Seed Balls) is a fried ball-shaped pastry coated with sesame seeds on the outside that is crisp and chewy. 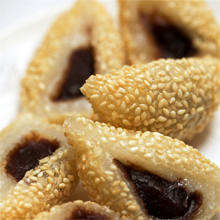 The pastry is filled usually with lotus paste, black bean paste or red bean paste. A more modern interpretation I’ve seen before are Jin Dui filled with chocolate and even durian. This is not a dim sum dish per say, as you can easily find them in various countries with differing interpretations. 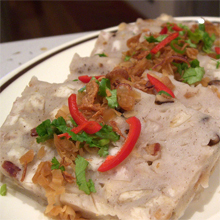 However, the fried version is one you would encounter in dim sum restaurants, usually filled with various meats. 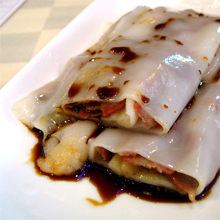 This dish is similar to Spring Rolls, with the main difference being the outer layer of the dish is made of tofu skin. 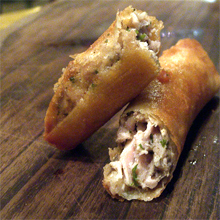 Just like Spring Rolls, you can find the fried and steamed versions, with various meat fillings inside of it. Phoenix Talons is the fancy way of translating this dish name, which is usually just called Chicken Feet by non-Chinese speaking eaters (like yours truly). 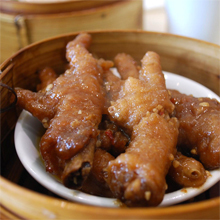 The chicken feet are first deep fried or steamed to make them puffy, and then stewed and marinated in flavored black bean sauce. The result is a dish that is moist, tender and flavorful, though it does consists of many small bones. 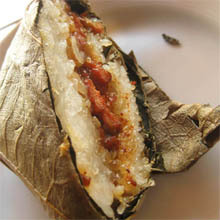 The English translation to this dish is quite a handful – Steamed Glutinous Rice in Lotus Leaf Wrap. It features glutinous rice filled with chicken meat and various vegetables, which is then wrapped in a dried lotus leaf and steamed. The result is a savory and flavorful dish, with the aroma of the lotus leaf and chicken melting into the sticky glutinous rice. A personal favorite. This is a common dessert made of sweet Chinese almond. Almond milk is extracted, sweetened and then heated with a gelling agent. 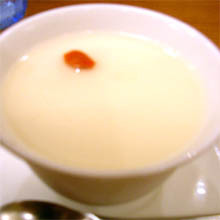 It is then chilled to create a tofu like pudding with a sweet almond taste. 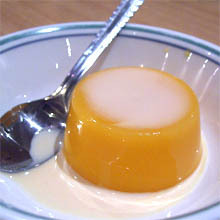 Last but definitely not least, is one of my favorite dessert – the Mango Pudding. This is the perfect way to end your feast, a simple dessert that captures the glorious flavor of mangoes like no other. When done well, the pudding is silky smooth in texture, rich in flavor and refreshing in taste. This post is part of WanderFood Wednesday, a Blog Carnival held by Wanderlust & Lipstick. Check them out for a visual treat of tasty dishes, or take part in the carnival yourself. Additionally, do check out as well our latest offering, our new Issue 02 of the magazine! If you are planning a visit to Asia, don’t forget to check out Unearthing Asia, the best Asia travel portalfocusing on Lifestyle, Culture and Attractions all over Asia. We have got some of the best travel ideas and inspirations in the region of Asia, such as this list of Singapore’s best romantic views. You can also find some information on cheap holidays to kavos here.